I received in the mail from the publisher a couple of weeks ago a copy of The Greek New Testament, which will probably be referred to as the Tyndale House Greek New Testament or THGNT. The official release date is 15 November 2017. Published by Crossway and produced at Tyndale House, Cambridge, under the editorial leadership of Dirk Jongkind (with assistance from Peter Williams, Peter Head, and Patrick James), this is a volume that has been in the works for ten years. It promises to offer many new features that have been overlooked in other Greek New Testaments. Among them, the editors have particularly focused on the spelling of various verbs that may involve an itacism (if that’s even the right word—something the editors challenge). On the Evangelical Textual Criticism blogsite Peter Williams notes that γίνομαι in Luke is always to be spelled γείνομαι, “a prestigious koine spelling by careful scribes to bring out the long vowel which arose when the second gamma of the Classical form γιγνομαι was dropped.” At first I thought that this ETC note showed that Luke’s usage was a higher register of Koine Greek, but when I looked at the Introduction in the THGNT I saw that this spelling is followed in Luke, Mark (! ), and Romans through Colossians, as well as a couple of verses in John (THGNT, 509). The editors do express the view that their objective was to represent the wording of the autographs—“This edition aims to present… the best approximation to the words written by the New Testament authors…” (THGNT, 505 [italics added]). But they do not seem to follow this same spelling for the first principal part of γίνομαι for Acts. The reason is presumably due to documentary evidence: we have P75 for Luke, but nothing truly comparable for Acts. But are we to suppose that Luke’s spelling of this verb changed to the shorter form every time it occurs in Acts (Acts 2.43 [bis]; 4.30; 5.12; 8.13; 12.5, 9; 14.3; 19.26; 21.14; 23.10; 24.2; 26.22; 27.33; and 28.6)? This raises the question of how rigid we should be in following the earliest documentary evidence (through the fifth century), a principal explicitly stated several times in the THGNT Introduction. Overall, however, reproducing the earliest documented spellings is a noteworthy contribution of this tome. Χριστός is not capitalized in spite of the fact that “it may sometimes be a proper noun” (THGNT, 511). That ‘sometimes’ is quite the understatement since in the Epistles this is the normative force. Another innovation is to follow the actual paragraphing of the manuscripts, especially the early ones. The reader will notice several differences from the Nestle-Aland text in this regard. For example, in Ephesians 5, Nestle-Aland starts the third paragraph with v. 21 which incorporates the following three verses (22–24). THGNT ends the previous paragraph with v. 21, thus implicitly distinguishing the instructions to wives from the concluding adverbial participle, which would make that participle dependent on the command to be filled by the Spirit (πληροῦσθε in v. 18). This is indeed the paragraph break found in Sinaiticus and Alexandrinus. Vaticanus incorporates a much longer section as its paragraph (P46 has no ekthesis or paragraph notation for Ephesians). But the question is raised whether the break at v. 22 is due, in part, to the editorial decision to include υποτασσεσθωσαν in 5.22—in spite of our two earliest witnesses to this text—B and P46—lacking any verb for the verse. The editors, as a rule, always base their text on at least two Greek manuscripts, and one of these must be from the fifth century or earlier (THGNT, 506; the Apocalypse is the only exception to the rule of having at least one early manuscript). This is in keeping with the strong documentary basis for this edition of the NT. This principle, however, seems to create some inconsistencies, one of which was noted above. It seems in fact that the documentary principle is often pitted against the recovery-of-the-original-wording principle. Many scholars today would question whether such a strong emphasis on the external evidence should be followed religiously. Readings such as Ιησουν and Ιησουν τον in Matt 27.16, 17 respectively, οργισθεις in Mark 1.41, εχομεν in Rom 5.1, and χωρις in Heb 2.9 are rejected by the editors in spite of strong internal support for these variants. Yet they have ηπιοι in 1 Thess 2.7 even though this is poorly attested among the earliest Greek witnesses. The apparatus is barebones and intentionally so. The editors want this work to focus on the text. They include variants of just three sorts: (1) viable, (2) exegetically important, and (3) those that illustrate scribal practices (THGNT, 515). The textual commentary on the decisions in this Greek New Testament is eagerly anticipated. I was of course happy to see acknowledgment of the Center for the Study of New Testament Manuscripts (www.CSNTM.org) as one of the main Internet sites that the editors utilized for reading digitized images of the manuscripts (THGNT, 526). Criticism is easier than construction, and the editors of the THGNT are to be commended for offering a significant alternative to the Nestle-Aland text—and one which is still based on the principles of reasoned eclecticism. This volume joins the work of Michael Holmes, The Greek New Testament: SBL Edition (2010), as a viable option for students learning New Testament Greek. THGNT depends more on external evidence while GNTSBL leans more toward internal, yet both are well within the broadly consensus method of NT textual criticism as it is practiced today. Of course, nothing can replace the decades of careful research that Münster has poured into their apparatus, but these two editions (Holmes and Tyndale) are important offerings; they help students of the New Testament realize that the Textus Receptus status of the Nestle-Aland text may still be a bit premature. The Center for the Study of New Testament Manuscripts (CSNTM) conducted a series of interviews with scholars of textual criticism at the Society of Biblical Literature conference in San Diego, California in 2014. These videos are currently being released on CSNTM’s iTunes U site for free. The first two interviews are by Dr. Ekaterini Tsalampouni of the Aristotle University of Thessaloniki and Peter Gurry, a PhD candidate at the University of Cambridge. Make sure to check out these interesting and significant videos as they continue to come out over the next few weeks. In Bowman’s booklet are two chapters, which correspond to the two articles in The Indian Standard. The first chapter addresses the process of photographing the manuscript, and is a window on the difficulties that attended such labors in the 1920s. It took the author nearly three months to photograph it! Today, with digital photography, the Center for the Study of New Testament Manuscripts normally photographs a 350-page manuscript (the size of Codex Robertsonianus) in less than a day. In this chapter he mentions the rarity of photographs of New Testament manuscripts: “Very few complete MSS of the N.T. or portions thereof have hitherto been photographed: I am personally aware of only five such” (5). Bowman’s second chapter discusses many fascinating details of the manuscript. One thing is largely missing, however, from the book: except for small snippets here and there, the correspondence between Deissmann and Robertson is not mentioned. This blog thus supplements Bowman’s pamphlet with Deissmann’s letters to Robertson concerning the codex (I do not have access to Robertson’s responses to Deissmann). Below are photographs of the first letter (along with the text printed beneath each one), which was obtained from Southern Baptist Seminary. In later blogs, I will post the rest of the letters and text. 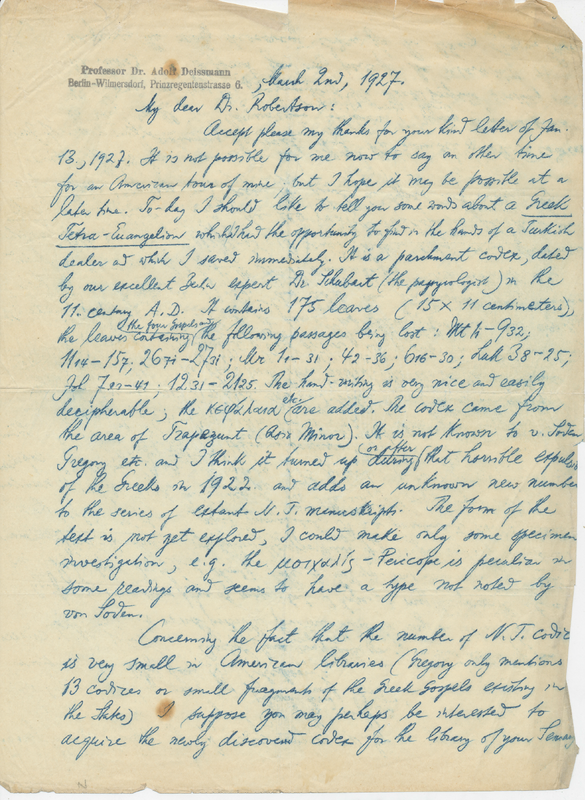 These letters constitute the A. T. Robertson Papers, Box 7, Folder 3, Archives and Special Collections, James P. Boyce Centennial Library, The Southern Baptist Theological Seminary, Louisville, Kentucky. I am grateful to Adam Winters, archivist at SBTS, who provided the photographs. They are used with permission of the SBTS Archives & Special Collections. Berlin-Wilmersdorf, Prinzregentenstrasse 6., March 2nd, 1927. 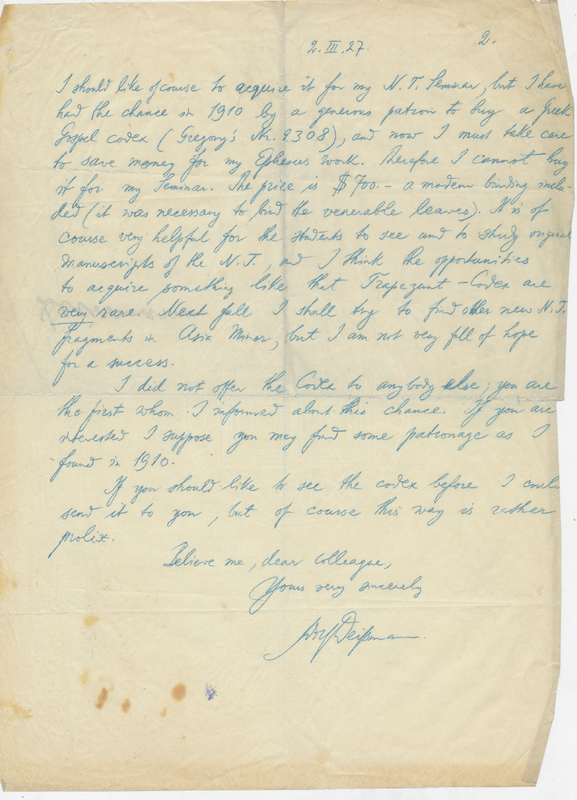 Accept please my thanks for your kind letter of Jan. 13, 1927. It is not possible for me now to say an other time for an American tour of mine; but I hope it may be possible at a later date. To-day I should like to tell you some words about a Greek Tetra-Euangelion which I had the opportunity to find in the hands of a Turkish dealer and which I saved immediately. It is a parchment codex, dated by our excellent Berlin expert Dr. Schubart (the papyrologist) in the 11. century A.D. It contains 175 leaves (15 x 11 centimeters), the leaves containing the four Gospels and the following passages being lost: Mt 11–932; 1114–157; 2671–2731; Mr 11–31; 42–36; 616–30; Luk 38–25; Joh 723–41; 1231–2125. The hand-writing is very nice and easily decipherable; the κεφάλαια etc. are added. The codex came from the area of Trapezunt (Asia Minor). It is not known to v. Soden, Gregory etc. and I think it turned up during or after that horrible expulsio[n] of the Greeks in 1922. and adds an unknown new number to the series of extant N.T. manuscripts. The form of the text is not yet explored, I could make only some specimen investigation, e.g. the μοιχαλίς-Pericope is peculiar in some readings and seems to have a type not noted by von Soden. I should like of course to acquire it for my N.T. Seminar, but I have had the chance in 1910 by a generous patron to buy a Greek Gospel codex (Gregory’s Nr. 2308), and now I must take care to save money for my Ephesus work. Therefore I cannot buy it for my Seminar. The price is $700.—a modern binding included (it was necessary to bind the venerable leaves). It is of course very helpful for the students to see and to study original manuscripts of the N.T., and I think the opportunities to acquire something like that Trapezunt-Codex are very rare. Next fall I shall try to find other new N.T. fragments in Asia Minor, but I am not very full of hope for a success. I did not offer the Codex to anybody else; you are the first whom I informed about this chance. If you are interested I suppose you may find some patronage as I found in 1910. If you should like to see the codex before I could send it to you, but of course this way is rather prolix. A basic search function now allows users to look at manuscripts by date, material, content, etc. You will notice a new search bar at the top of the manuscripts page. Simply enter in the data you’re looking for, and only those manuscripts that meet the criteria will be displayed. Viewing technology has been added, allowing users to see thumbnail images instead of just a link. Simply click on the thumbnail and the high-resolution image is displayed in the viewer below. Users can now zoom in and examine manuscripts without having to open individual pages. This feature is currently available only for manuscripts digitized on the last five expeditions (Biblioteca Medicea Laurenziana in Florence; Gennadius Library in Athens; University of Athens Historical Museum; City Historical Library of Zagora, Greece; and the Chester Beatty Library in Dublin). More to come! The website also provides links to the images of 29 (and growing!) significant manuscripts in various libraries throughout the world. CSNTM currently has over 450 manuscripts listed in its manuscript page, with more than 1100 manuscripts in our archives. We are working on getting all 1100+ manuscripts listed on the site. As always, when the Center gets permission, the images of manuscripts become accessible to all. 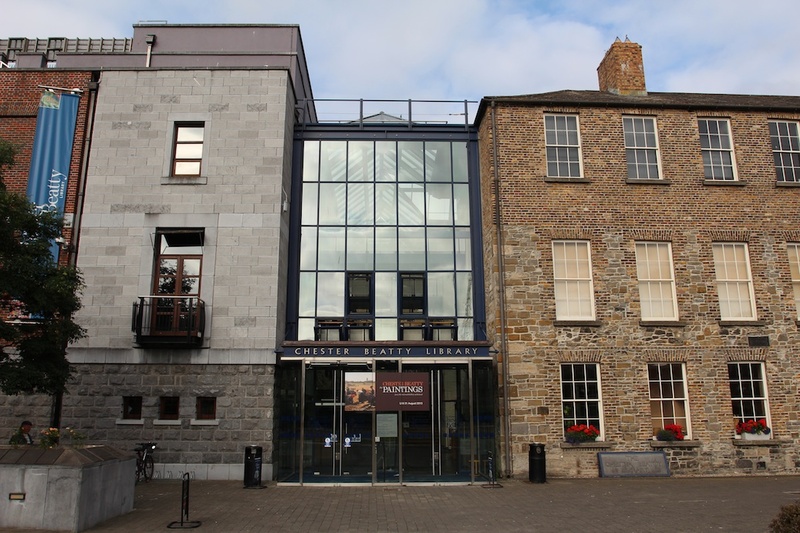 The most exciting new additions to the CSNTM website are the Chester Beatty biblical manuscripts (which we digitized in the summer of 2013). 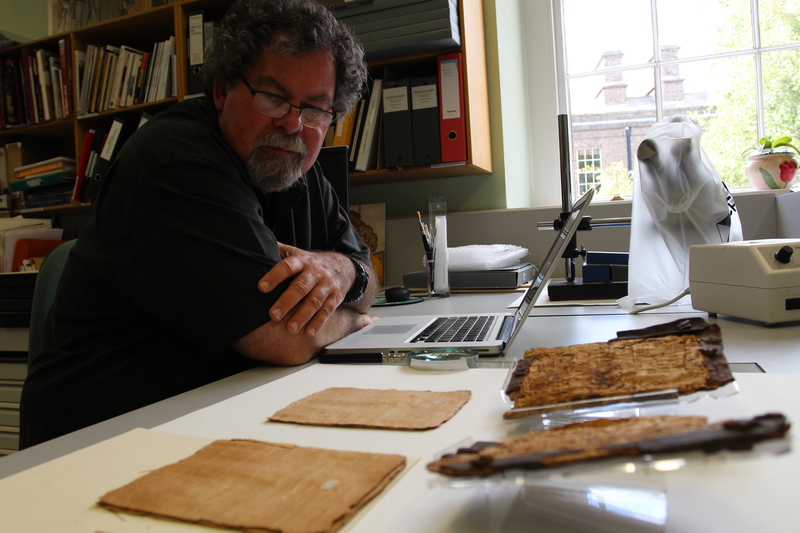 These include all Old and New Testament Greek papyri, apocryphal texts, and all Greek New Testament manuscripts housed at the CBL in Dublin. Best of all, these can now be viewed on the manuscripts page. Using state-of-the-art digital equipment, the Center photographed each manuscript against white and black backgrounds. The result was stunning. The photographs reveal some text that has not been seen before. CSNTM is grateful to the CBL for the privilege of digitizing these priceless treasures. The staff were extremely competent and a joy to work with. We are grateful to Dr. Fionnuala Croke, Director of CBL, for the opportunity to digitize their biblical texts. And we wish to thank Dr. Larry Hurtado, Edinburgh University, and the late Dr. Sean Freyne, Trinity College, Dublin, for recommending CSNTM for this important undertaking.